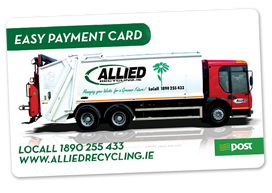 Welcome to Allied Recycling, an Irish owned family company serving our domestic and commercial customers for over 20 years. We provide an efficient and professional service and make sure that our customers requirements are always met. Our friendly staff are trained to help you choose the right skip or the right price plan for your wheelie bins and answer any query you may have. Our customers are our number one priority and we aim to provide the best service that we can. There will always be someone at the end of the line for our customers to talk to.